Since I plan to sell at a few public venues this Fall, I'm expanding my felt making work. This expansion includes hats and scarves among other things. I recently took some new promotional photos of my work for advertising and my artist portfolio. 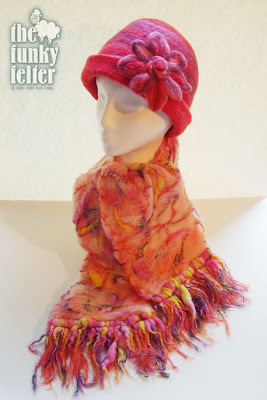 I just wanted to share a photo of one of my handmade felt hats and scarves. You can see all six promotional photos on my flickr account. We can get really productive when we know that a big event is coming up. I'm getting ready for the Michigan Fiber Festival which is pretty hard to get into also.